First Listen: Dan Mangan + Blacksmith, 'Club Meds' On the Vancouver songwriter's fourth album, he plays with abrupt changes of tone and texture. Carefully conceived instrumental passages expand upon — and sometimes upend — his lyrics. The new Dan Mangan + Blacksmith album, Club Meds, comes out Jan. 13. You can tell a lot about a songwriter by what occurs in the space between verses. Many writers — hacks and gifted souls alike — will treat an instrumental expanse as a kind of please-stand-by strumming wallpaper, a palate cleanser for the ear. In this strategy, derived from folk music, the focus remains forever on the narrative; the "action" in a song directly depends on the voice. Vancouver based multi-instrumentalist Dan Mangan started out writing songs that way. Now he sings a bit less and lets carefully conceived instrumental passages expand upon — and sometimes upend, or entirely obliterate — the lyrics. "Offred," the opening track of Mangan's fourth album, Club Meds, offers a clue about how he and his savvy band Blacksmith approach interstitial space. The first verse concludes with a bewildered shrug — "What is it at all?" — that sounds like it was sampled from a joyless postgraduate philosophy roundtable. The phrase hangs in the air like a professor's taunt, but almost immediately a plague of audio locusts swarms across the soundfield, tense strings and chorales of distorted guitars changing the weather. The cloudlike blur of sound is not obviously connected to the preceding verse, and lasts only 16 tense measures. But in that time it changes the scope of the song. After the menace of the interlude, that existential question, "What is it at all?" — which returns in the second verse — resonates differently. There are many of those refractions/switchbacks on the vivid, wildly ambitious Club Meds. Compositionally, the songs are fairly orderly verse-chorus rock creations with, perhaps, an extra shot of harmonic vinegar. But they unfold at a natural pace; Mangan knows his King Crimson, and his Peter Gabriel, and understands how to build tension one precious element at a time. Most of Mangan's tunes have at least one or two instrumental excursions, moments when the narrative is put on hold so that the musicians can veer off the predictable course — their pursuit of the improbable and the idyllic leads to musical realms where straightforward hooks never go. The experimental detours give the songs distinct shape and also, not incidentally, provide listeners time to process Mangan's listy, random, less-than-linear lyrics. 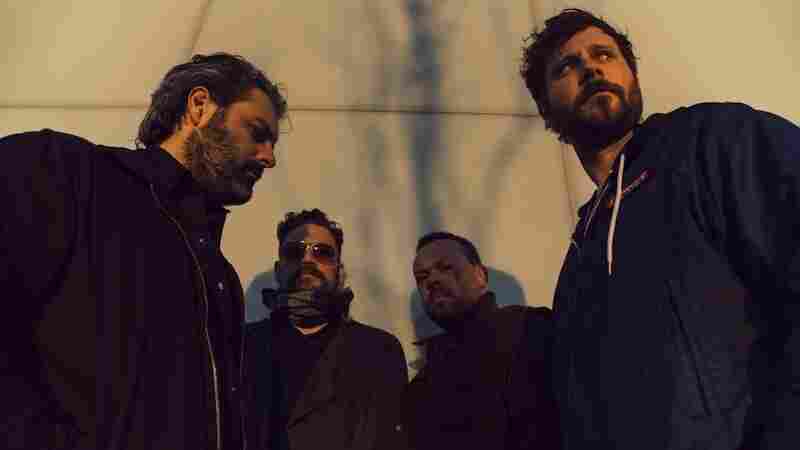 Sometimes the interludes operate by the element of surprise: The album closer, "New Skies," starts out in a slow tempo and a pensive, space-rock mood. At the end of the second verse, there's a thundering Pink Floyd-style drum fill that sounds for all the world like it's ushering in a majestic refrain. Instead, what follows is the sound of a tipsy New Orleans brass band in full shriek, and a trio of rock guitarists shrieking right back until the earlier theme becomes a distant memory. As on the previous Oh Fortune, his acclaimed 2011 release, Mangan organizes things around sharp contrasts. These songs have more than a whiff of the meta about them, and the abrupt changes of tone and texture actually help to keep them in the vicinity of humanity. There are moments when the music billows to full cry at the mountaintop ("Mouthpiece") and inverse moments (the Kurt Weill-esque waltz "XVI" or the even more disconsolate "War Spoils," which has echoes of Erik Satie's piano music) when it surveys the dry creek beds of a lonely valley. Mangan grabs what he needs to decorate each individual episode properly — he has an uncanny knack for assembling combinations of voices and instruments into odd, slightly off-kilter contraptions. He seems aware that his voice, alone, is an unexceptional instrument; the most memorable vocal performances here, among them the brilliant "Forgetery," involve multitracked layers of voices. On the stirring Gabriel-influenced "Vessel" (which has an incredible animated video), Mangan shouts the mantra-like verse with rock star abandon, but when it comes time to lower the boom for the catchphrase — "it takes a village to raise a fool" — he goes all arty, drenching the multiple overlapping voices with slurpy, tone-mangling Brian Eno-style effects. Usually when an artist deploys such a kitchen-sink amalgam of sounds and colors, the music is diffuse, a hipster pastiche of momentarily fashionable ideas. That's not the case with Club Meds. Mangan integrates his thick arrays and the image-rich between-verse detours into the structural bones of his narratives. He's got an explorer's bent but knows better than to let the music wander too far into nebulous space. Every move, even the most dissonant improvised ad-lib, serves to in some way or other enhance the core of the song. Mangan pays great attention to continuity — he starts with sleek, vibey atmospheres, then finds little ways (recurring piano jabs, a looping bass line) to knit things together, as though he intuits that his type of high-concept writing connects best when there are elements his listeners can grab onto. His band, which shifts from serene contemplation to utter chaos in the space between backbeats, helps in this regard. Whenever Mangan creates a dangerously sharp, unmarked left turn, the musicians make it feel like the entirely inevitable next step — where the song was going all along.